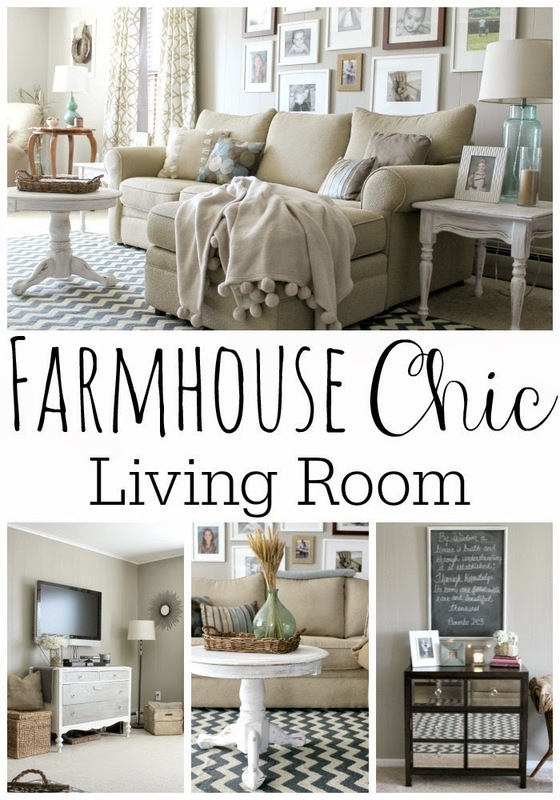 I've made quite a bit of progress in our living room since we moved into the farmhouse. It's still pretty much furnished with things we already had from our previous home, but it's working out fine for now. Ultimately this room could use a larger couch and maybe a larger chair somewhere, but for now I'm going to make what we already have work. Either way the recliner will stay. It's the one piece of furniture that I really really dislike, but my husband loves it of course, so I'll just keep working around it. 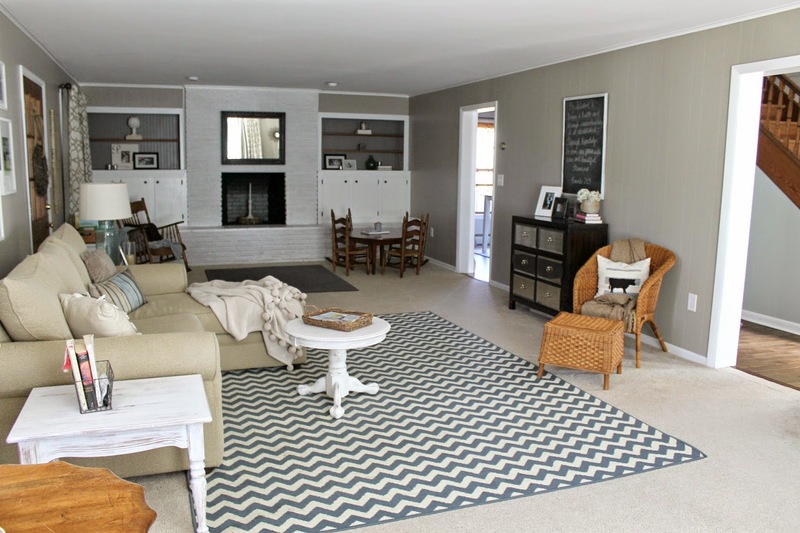 The walls are painted a soft beige/tan color. 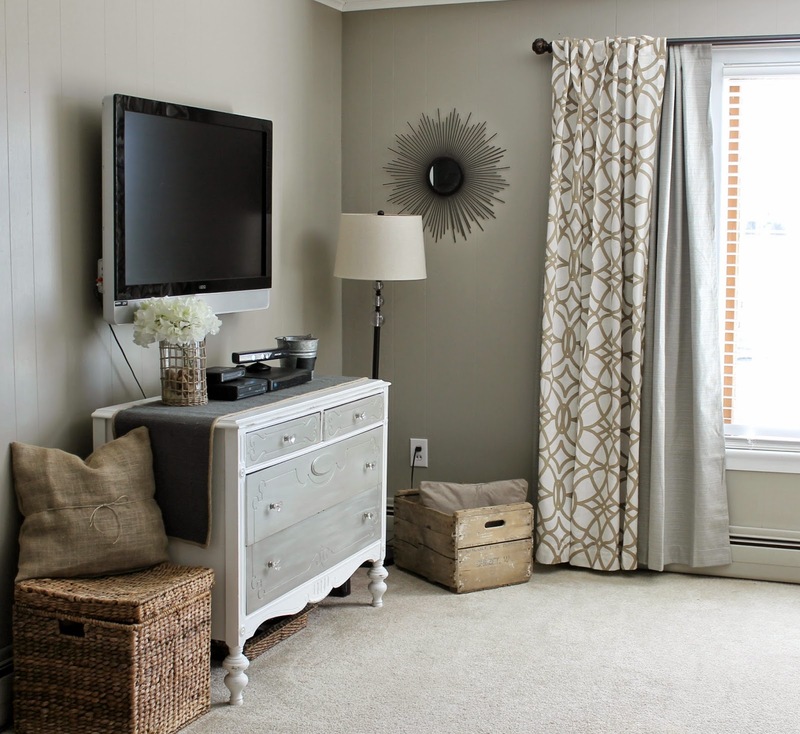 I love this paint color because even though it's soft, it adds warmth to this large room. Our living room is 30 feet long, so arranging furniture in here is still a challenge, but this layout seems to be working for us. In the beginning I placed the couch in the middle of the room in an attempt to create two separate areas, but it felt closed in and choppy, so I decided to put the couch against a wall instead. Now we have a nice open flow to this space, which I like much better. 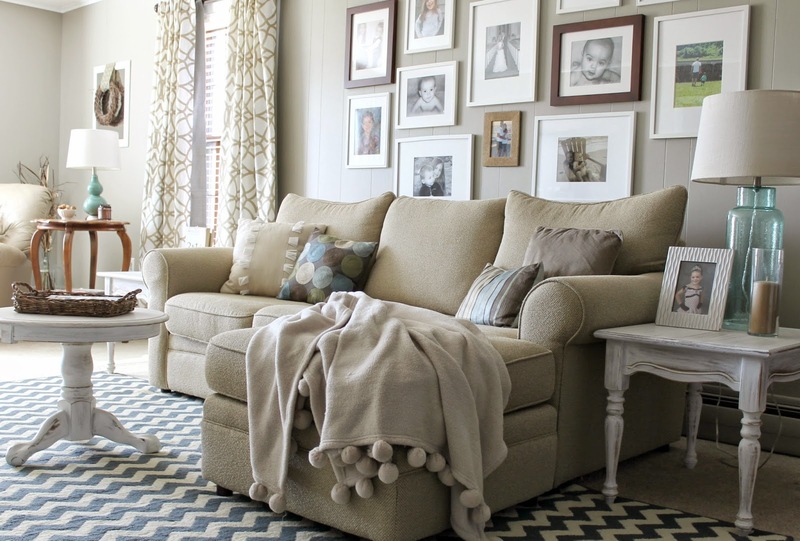 Neutral throw pillows combined with a couple of pops of color keep things interesting. 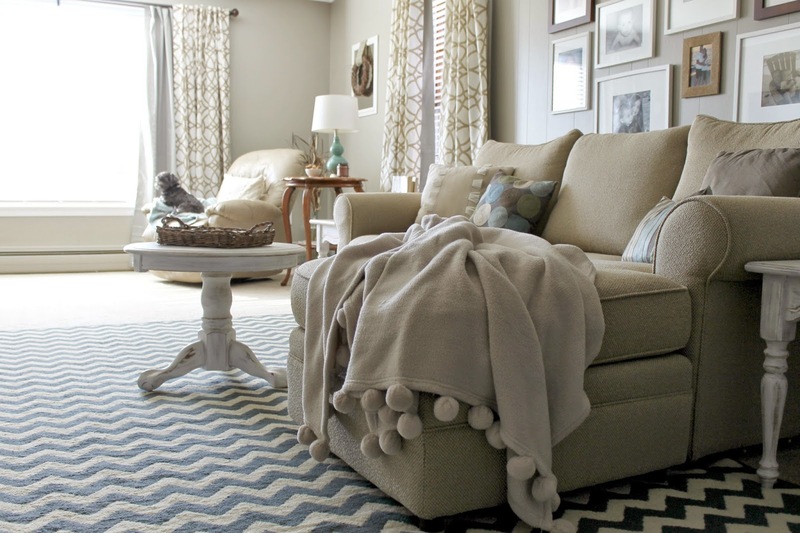 The pom pom throw completes the cozy look. 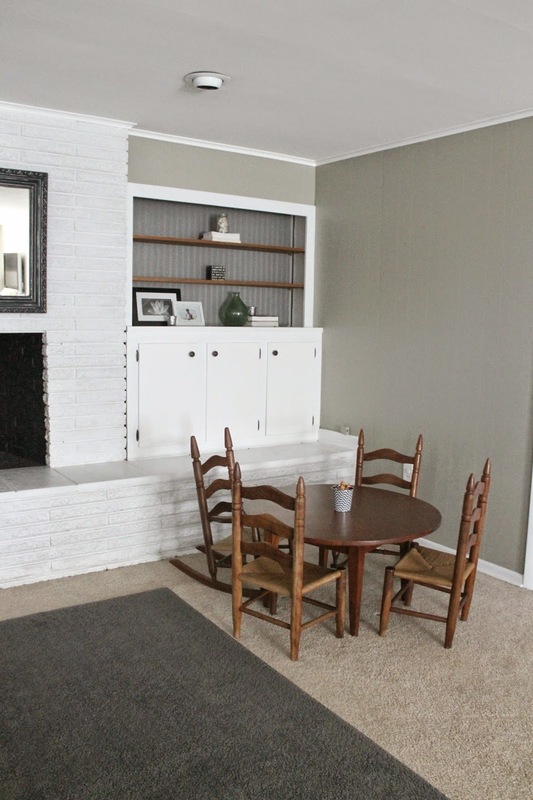 The giant gallery wall was one of the first decorating projects I completed here at our farmhouse. It instantly pepped up this room. I love the mix of frames and having my favorite photos on display where they can always be seen. I've added a little more to the TV area since I shared my dresser makeover. The sunburst mirror is something I've had for a long time, it's an old Target find. I recently found the vintage crate at a local antique shop, and I hung new thermal curtains to keep out the cold. Our windows are old and very drafty! Charming windows, but not so great during these cold months! 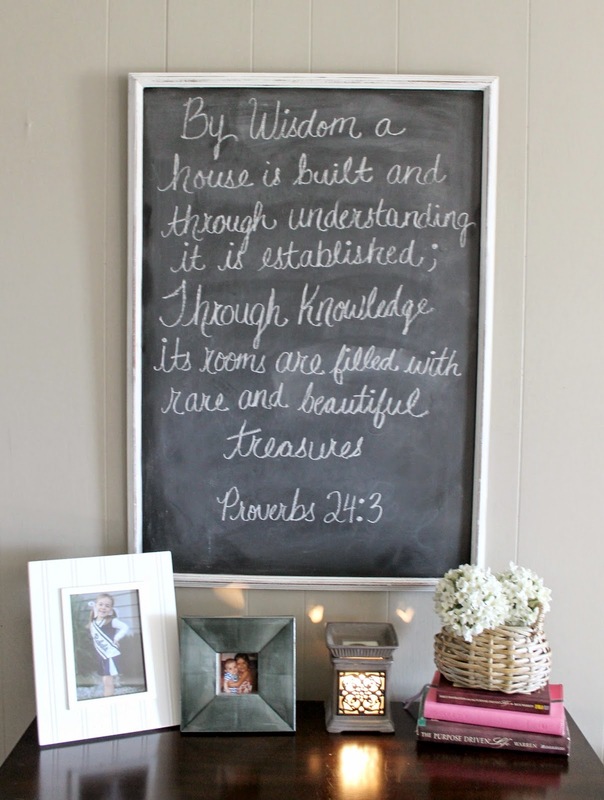 And since I'm chatting about our living room, I thought I'd share my DIY chalkboard again. It's the same chalkboard I made for our Christmas card display. The side of the room where our fireplace wall is still needs some work. I'm still trying to figure out a good furniture set up. Right now I'm leaning towards two matching comfy chairs and a big ottoman in the middle, so we will see. This room has definitely come a long way, but I still have big plans for it! 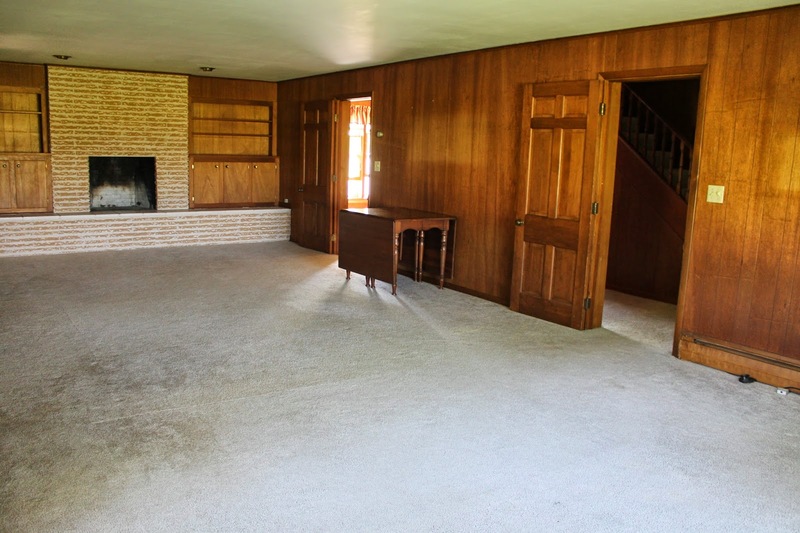 A few things on my list include ripping up all the carpet to reveal the original hardwoods underneath, and adding something to the ceiling, maybe bead board or possibly beams. I also hope to add two big sliding barn doors to the two doorways, as well as furnish the space near our fireplace. Exciting projects to look forward to! And now a look back at the before photos, that's always my favorite part! Your living room is just gorgeous! I love the colors and that you used furniture you already had. I also have a long, narrow family room and it's very hard to decorate. You've done a great job! I couldn't believe the before pictures! It doesn't even look like the same room! I love the colours that you've used... so soothing and cozy! It's such a big room and yet you've managed to make it feel very warm and inviting. Can I jump on that couch and cuddle up with that pom-pom throw? Thank you Melanie! It is pretty cozy! And that pom-pom throw is very cuddly! Thanks so much for you kind comment! That is GORGEOUS!! I really love the colors and everything looks so good together! Susan thank you so much! Such a gorgeous room! Where did you find your drapes? I think they are just what I'm looking for in my hallway! Thank you Kate! The drapes and all the curtain rods are from Lowes. 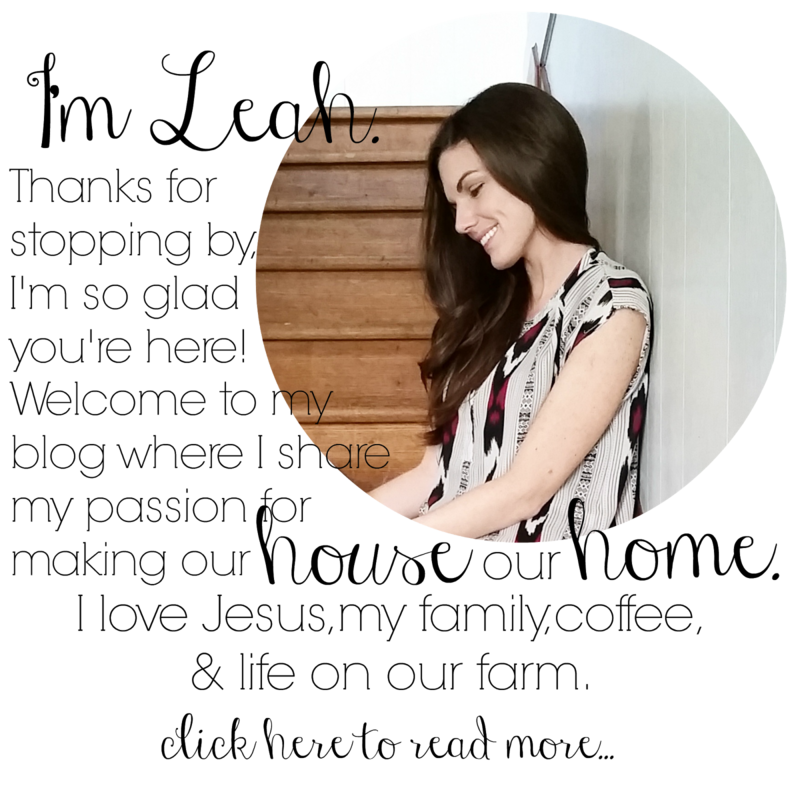 Thanks so much for stopping by and taking the time to comment! Wow! What a transformation! 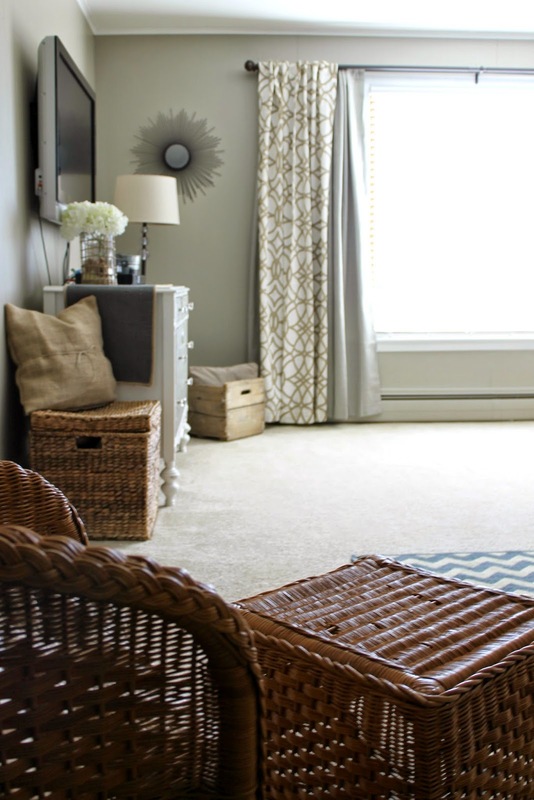 Can you tell me the source for your pom pom throw? Great job on your beautiful room. Thanks Kim! The pom pom throw was a TJ Maxx find and I paid $12 for it! An Instagram friend of mine just found very similar ones at Target in the children's bedding section. I hope that helps! Hi Leah. Love the transformation. I am also hoping you can provide a source list (for the drapes, especially. They are gorgeous). Thanks. Hi Leslie! Thank you so much! I've actually made a few changes to the room since this post and I will be posting again soon on those small changes. I hope to have a full source list ready then! The drapes are from Lowes and I am really happy with them so far! Beautiful room! Do you know the paint color you used? Thanks so much Missy! The paint color is Intellectual Gray by Sherwin Williams. Beautiful room! I'd like to purchase a throw like that, where did you get it? Hi Tam! Thanks so much! The throw was a TJ Maxx find a while back, but one of my Instagram friends found similar ones at Target recently in the children's bedding section, hope that helps! Wow Angela! Thank you so much! Beautiful color combination! Much like my own living room, no wonder I love it! Feels so homey. Thanks so much Patty! I'm so glad you think it feels homey because I have really struggled to create that kind of feel in such a large space so thank you!! So very pretty and I envy you the large room. I know you say you are finding it difficult to arrange furniture but in my tiny 15x11 living room, nothing fits. Furniture nowdays is so large, made for the big homes. I am looking for a smallish round coffee table just like yours. Can you tell m where you found it? Lovely room! Thanks Karen! I had a much smaller living room in my last house and honestly I liked it better because it was so cozy and just so much simpler, but I'm typically drawn to smaller spaces anyways. The table was a yard sale find that I made over with chalk paint. I think it was intended to be used as a side/end table because of it's size. Maybe you could search around for end tables or side tables rather than actual coffee tables and you may find what you are looking for? 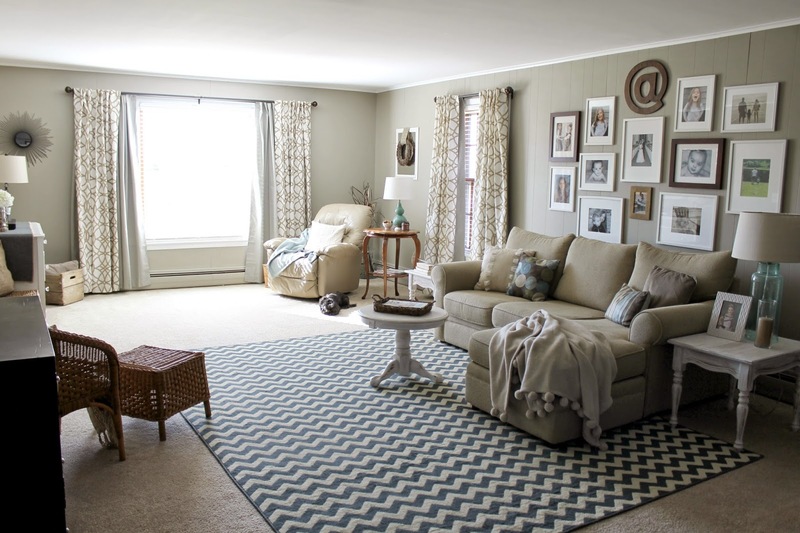 Thanks so much for commenting and best of luck on your living room! Looks amazing! And what a transformation! Isn't it fun to see the difference. We just finished with our living room and I still just sit and look at it for FUN! O so beyond beautiful!!!! This is exactly what I'm aiming for!! Where are your couches from! Your living room is beautiful! Where did you get your sofa? A true inspirational transformation. I love the light bright airy feel. I am trying to do something similar to mine. I recently married and along with my new husband I inherited his ex wifes taste......red carpet, red curtains and red leather furniture. Not my taste at all. I am going with whites, creams and neutrals as well. This shows what one can do with a little imagination. Can't wait to see what else you are transforming. I love what you have done with your living room, it's so cosy and calming. Perfect for relaxing family times. So different from how it started out. 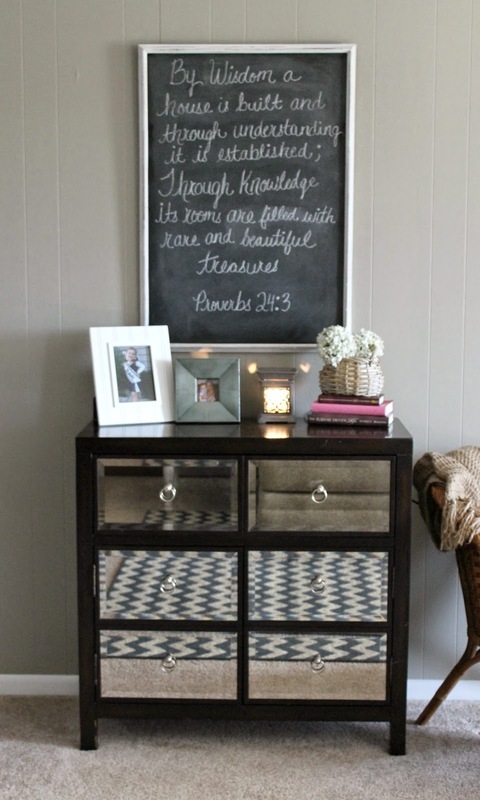 I think the little table and chairs and proverb board are my favourite but its hard to chose with such a lovely room! Thank you for sharing the photos with us. what a transformation! 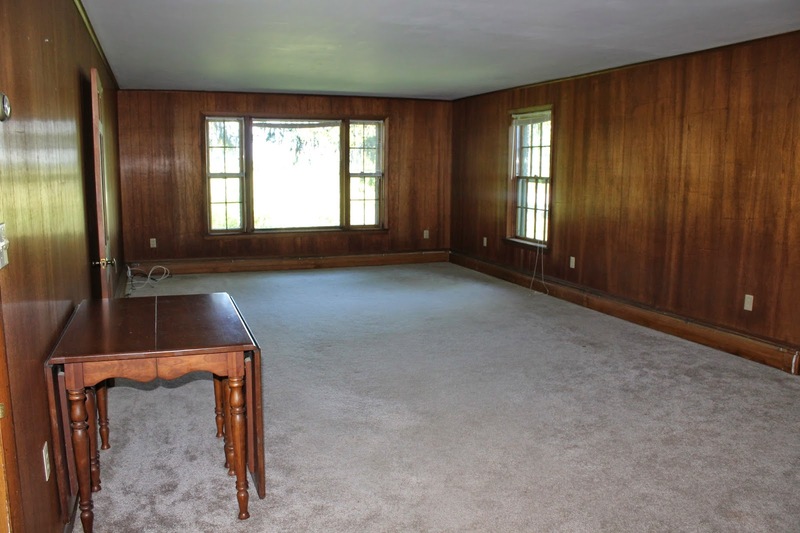 did you paint the wood or drywall over it? or pry it off? HELLO! Love the transformation and all you did. I'd really like to find a couch like you have. Will you tell me where you found yours? Hi Eli, thanks so much! We found ours at a local furniture store, but I've seen them on Wayfair.com! The brand is CraftMaster. Hope that helps! I love your gallery wall. Where did you get your frames from?